THE FUN OF CAPTURING A SPECIAL SETTING OR SUBJECT AND BRINGING IT TO LIFE! Creating original fine artwork for clients (who more than often become dear friends in the process) is one of the MOST rewarding aspects of being an "AMERICANA" artist. There are dozens of architectural styles and I appreciate all of them in one way or another. However, my favorite details are found in handsome older structures ~ a deep fascination with me since I first picked up a brush and tube of paint some five decades ago. 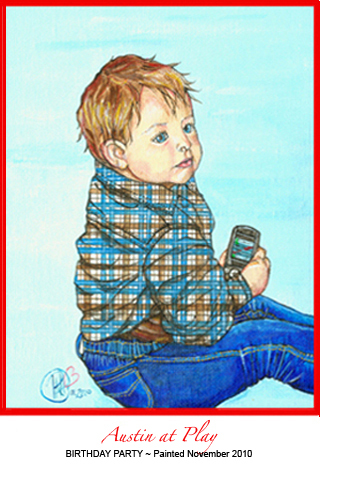 Recently, in addition to portraits of homes, parks and landmarks, I'm also creating paintings of children and pets. Our loved ones grow and change so quickly that many clients appreciate a special moment in time captured. 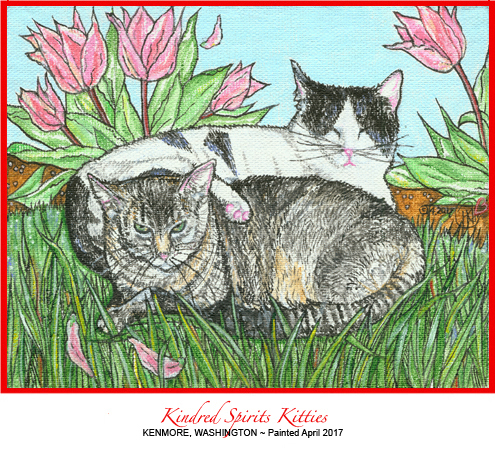 You'll find three NEW pet portraits on this page below in the "Our Beloved Pet Companions" section. In this photo, I'm pictured hosting a small exhibit at a Spokane Preservation Advocates Tour of Historic Homes destination residenc. 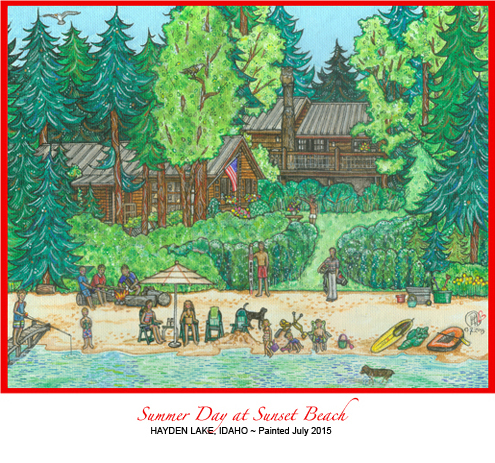 I am displaying my work at Russ and Sara Weaver-Lundberg's Storybook-style cottage on Overblfuff Road. The painting I created is on an ease to the left in the photo here. 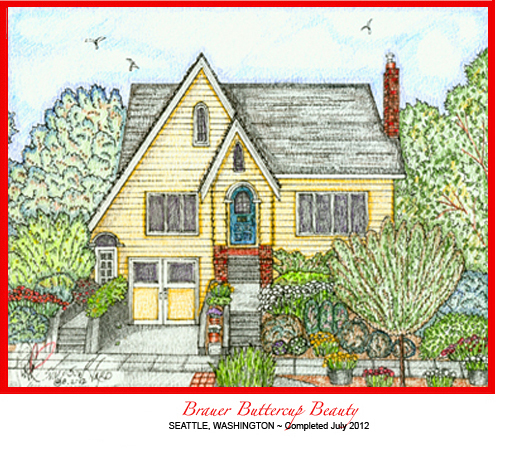 The image their historic cottage is featured below in the "Paintings ~ Home & Garden" section. 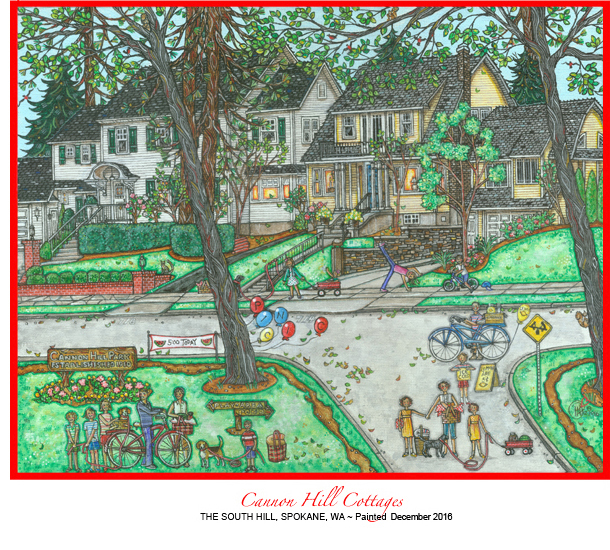 Highlight ~ Click on Entire South Hill Collection pdf. 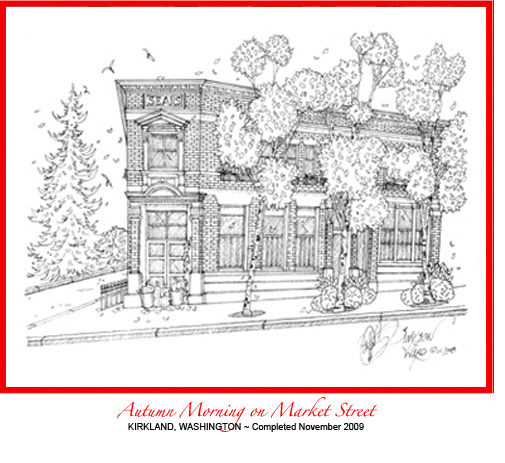 In the "Public Buildings (Beloved Churches, Schools and Small Businesses" section on page 15 you wil learn about about Sara's special connection to the small vintage brick building that houses Lindaman's Bistro south of Saint John the Evangelist Cathedral. CASTLES INDEED ~ For many of us, this statement is true. 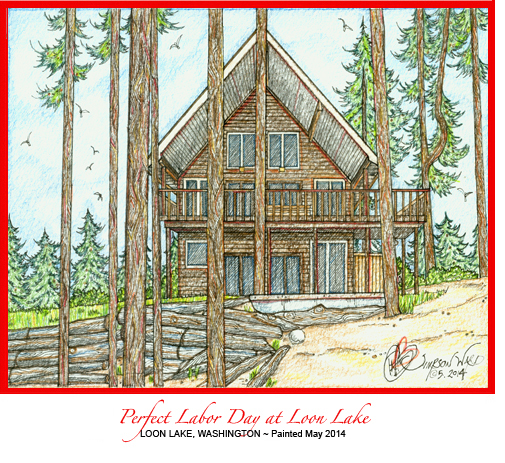 Whether we are homeowners or renters, many of us fall in LOVE with the places we lovingly call home. We spend our weekends renovating, redecorating, updating and doing everything that we can to make our homes our "own." 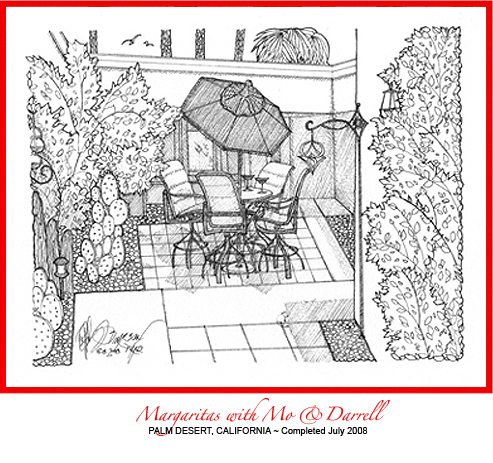 We choose just the right furnishings, paint colors, accessories ~ even plants, shrubbery and outdoor art for the garden ~ to leave a special thumbprint that reflects our own personal style. If you are like me, we don't look at our homes as just places to hang your hat, but rather as palettes where we often find that we are at our creative best. DIY ~ Every year there seems to be more home improvement magazines at the grocery store and DIY shows on television. They promise to guide us to happy completion with every kind of DIY project. And, if that isn't enough, there's dozens of gardening "how to's" for everything from planting tiny herb window boxes to creating full-scale English gardens out of untamed tracts of land. SEASONAL DECORATING ~ For many of us, this love affair means changing the personality of our homes with accessories as the seasons and holidays unfold throughout the year. Christmas brings sparkling decorations and dozens of twinkling lights around the front entrance; Autumn, pumpkins on our porches; Spring, pots of jewel-toned bulbs in bloom; and Summer, red, white and blue bunting draped from the eaves of our homes with "Old Glory" waving in the breeze. 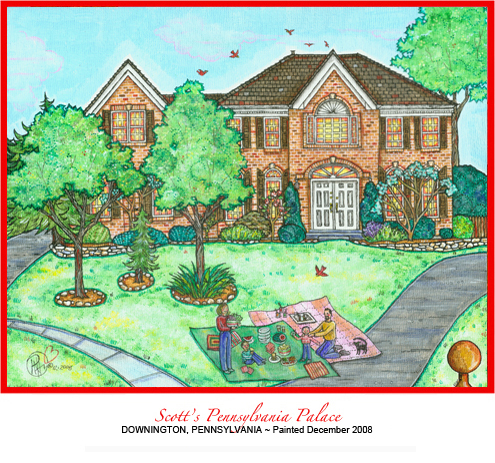 SPECIAL GIFT ~ If your home (or the home of someone you love) is a special "dream house," why not consider a commissioning a portrait of it? Learn much more further down on this page. 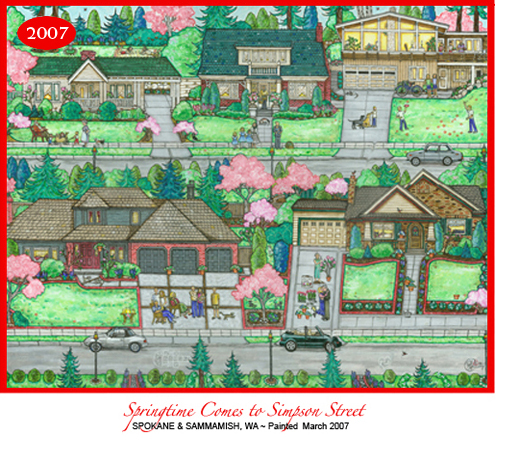 I've painted four "neighborhood" paintings since the mid-1970s. Most of my canvases are 8x10 inches, but all of the details I wanted to include in these pieces required larger sizes (11x14-inch and 16x20-inch). 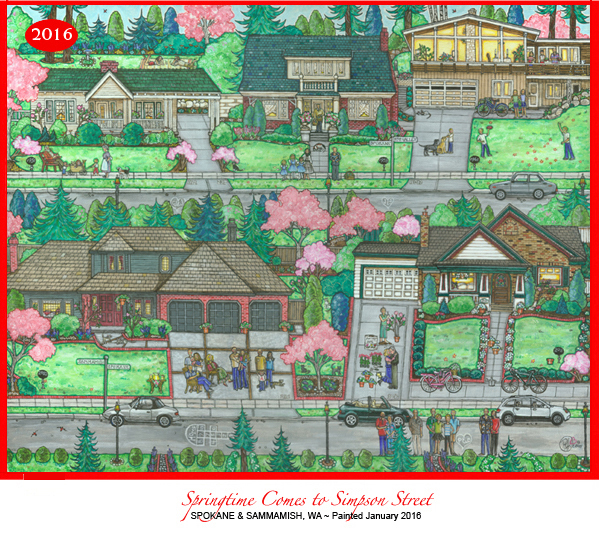 "SPRINGTIME COMES TO SIMPSON STREET" ~ Pictured here is the first original work, created in 2007, a revision of it in 2012 and the most recent piece from 2016 (above). Another update is on my list as daughter Leah and Sean added two little boys Connor and Nathan to their family ~ and son Kevin's wife Taryn just delivered Piper Elizabeth at the end of March 2018. Grandparents again! 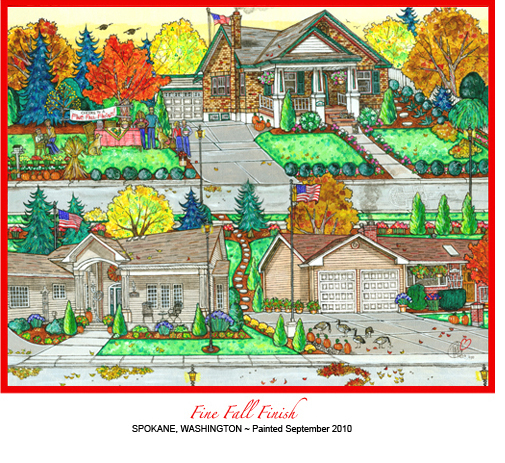 "FINE FALL FINISH" (2010) ~ I painted this as a gift for our contractors, Lance Elliott and Chris Garrett (Elliott Construction). They received framed prints after the extensive renovation of our bungalow that began as a 6-week project and grew into a 6-month one. I pictured Doug and me celebrating the "FINISH" with Lance, Chris, their sweethearts and pets at a picnic in the upper left portion of the art. Their homes are below ours and part of the "neighborhood." A huge undertaking with challenges at every turn, they finished our 6-month+ project beautifully. I wanted to give them something special to show our appreciation for all their hard work, so I created this piece. 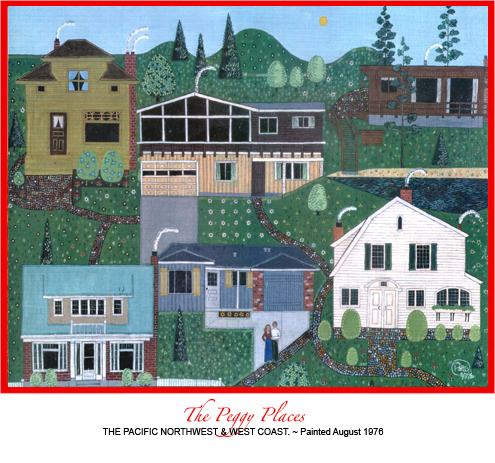 "THE PEGGY HOUSES" (1976) ~ This was a wedding gift for my sister Peggy and her husband Jeff, honoring all of the homes that they lived in before their marriage, including the California rambler near San Francisco Jeff bought for his new bride. Peggy still has this painting ~ and they are a happy retired couple decades later. Highlight ~ These two paintings show in a very real way how my style has evolved ~ becoming more refined and detailed over the nearly 40 years between the dates I completed these. 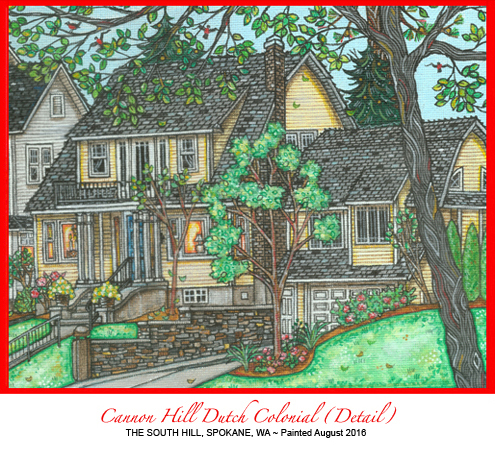 "CANNON HILL COTTAGES" (2016) ~ This painting pictures two beautiful Colonials ~ the white one with green shutters, classic in styling and the yellow two-story, a barn-roofed Dutch Colonial. 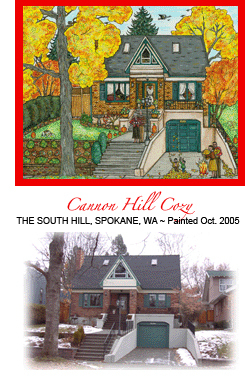 Both residences overlook Cannon Hill Park two blocks west of our bungalow on Spokane's South Hill. Doug and I love this neighborhood. More often than not, pleasant afternoons find us strolling the perimeter of this very inviting setting with its picturesque pond in the center. The families who lived in these homes for decades and their children who grew up here have very fond memories of good times spent here. In summer, Cannon Hill Park is dotted with picnickers ~ the theme of this painting. When the weather is nice, there are always mothers pushing strollers and kids in shirt sleeves riding bikes, playing on the swings and climbing on the basaltic rock bridges that years ago spanned the pond when it was much larger. In winter, folks of all ages still ice skate on Cannon Hill Pond. You can count on seeing boys playing some pretty brisk hockey. Every now and then, you'll see a bonfire with revelers toasting their backsides between outings on the ice. PARK HISTORY ~ At the turn of the last centuery, the park was a brick yard. When the clay deposits were exhausted, the Adams family (relatives of both Presidents John Adams and John Quincy Adams) donated the land to the city for this park. Adams park was later renamed for Spokane developer A.M. Cannon. 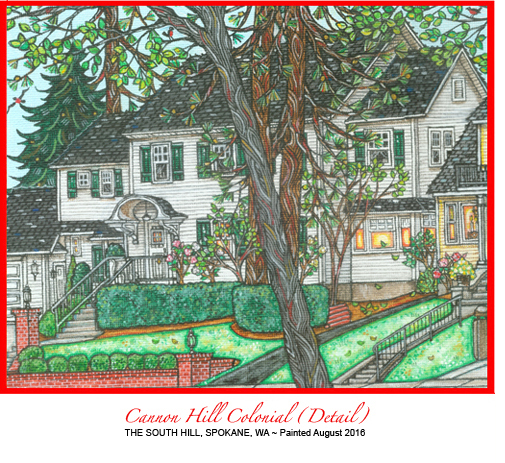 ARTWORK "DETAILS" ~ When I was about to paint the people into this piece in December 2016, Lynn Nevers DeWenter asked if I would create prints of just the yellow colonial ~ one for each of her siblings who grew up there. 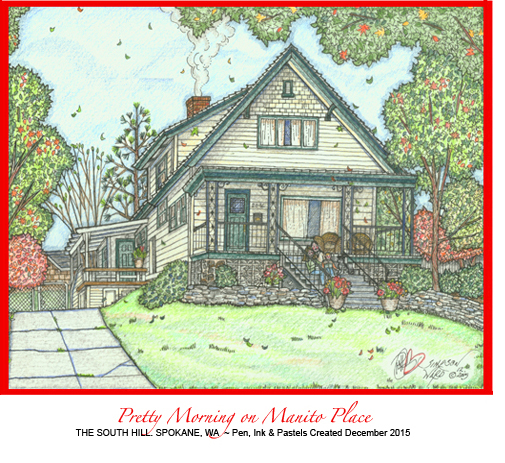 The Nevers treated themselves to a special gift of memories before the final art was complete. Highlight ~ Lynn was one of five women who grew up in these two homes who were my Holy Names classmates from 1964-1968. 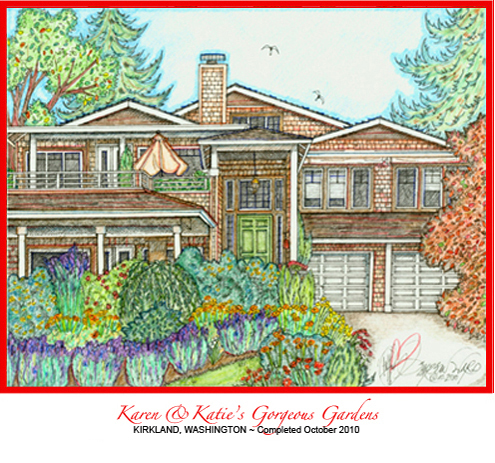 Kay Richardson Edmonds went on to purchase the original as a Christmas gift for her husband Todd after I added her grandkids in front of the yellow house. They've lived there for 30+ years after the Nevers left Cannon Hill. In addition to the Nevers' detail, I recently gave Brigid Lavin Kardong a print of the white house below, as that was her childhood home as well. Note ~ Paintings are best suited for portrait work as it's easier to make alterations to achieve the best likeness with that type of media. Commission fees vary widely. The cost is based strictly on both the amount of time it takes me to complete the art and on your choice of media. In other words, I record my hours and charge accordingly. Some media inherently takes longer than others. 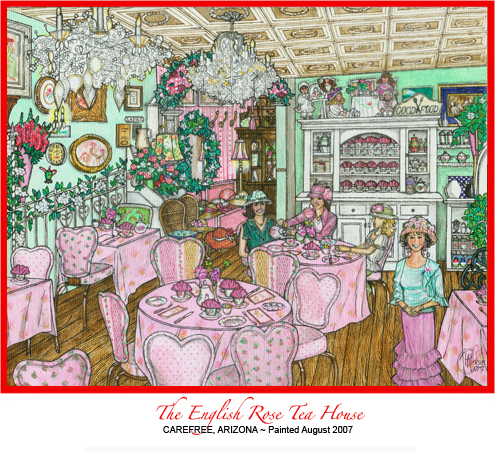 For exampble, paintings require more time to complete than pen & ink sketches. 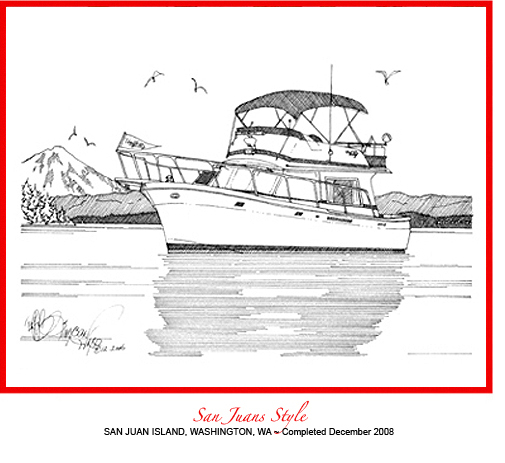 NOTE ~ consultations and framing of the finished art are always complimentary. Below, I've shared a gallery of 28 commission pieces (16 paintings, 8 pen, ink & pastels and 4 pen & inks). These feature many architectural styles and subjects. Beneath the gallery, you'll find tips for planning your commission followed by the "Challenges & Creative Solutions" section with more sample paintings and photographs. 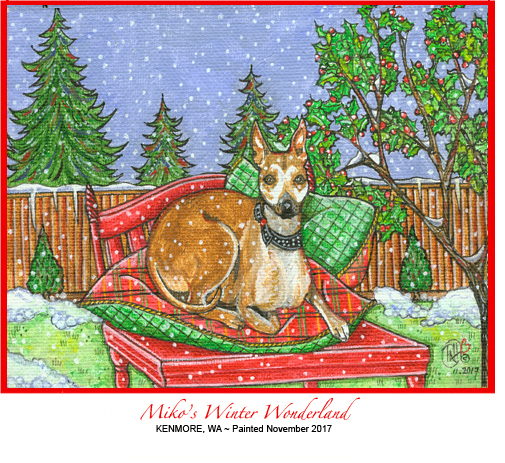 HOLIDAY CARDS WITH YOUR HOME PORTRAIT ~ For several clients, I've painted directly on a print of the original artwork ~ adding holiday details like wreaths, snow, family and of course, a Christmas tree glittering in the window. Voilé! Artwork for holiday cards! 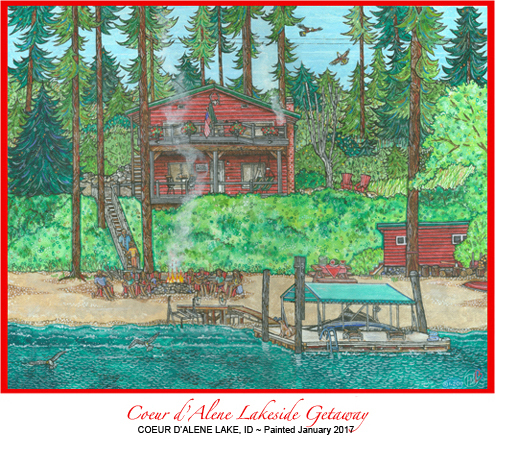 WEDDING INVITATIONS ~ For one engaged couple, after painting a portrait of their home (see "The Beautiful Day" below) I re-worked a print into a New Year's Eve scene with them as the bride and groom. Their invitation was a nice memento of the at-home ceremony for all their guests. Visit the Bridal page to see the artwork. All of my work is custom, so the first step is a meeting. We'll choose a time of day when there will be plenty of natural light as I may need to take some photographs. I'll share my portfolio, discuss your wishes and see what photos you may have on hand that you would like to share, as well. I may be able to work from yours ~ crucial if you live in another part of the country. What I need to complete your portrait is several long shots as well as details of windows, lighting fixtures, garden gates, bird baths, etc. Once again, with my colorful "Americana" style, it's ALL in the details. We want your special personality to shine through brilliantly! Garden details like bird houses or baths, benches, hanging flower baskets, tree houses, etc. Any other unique additions like a vintage "woody" station wagon, flag, "Congratulations" banner, etc. DETERMINING THE FEE & DELIVERY OF YOUR "MASTERPIECE"
Fees are always estimated, but I do my best to bring your project in on time and on budget. Normally, I receive a 50% deposit before I start. NOTE ~ the more specific you are about what you want at the start of the project, the less need for costly revisions later. When we meet to hand off your "masterpiece," I receive the balance (plus tax). In addition to your handsomely framed piece, I always include a print or a handful of art cards as my gift. CONGRATULATIONS! 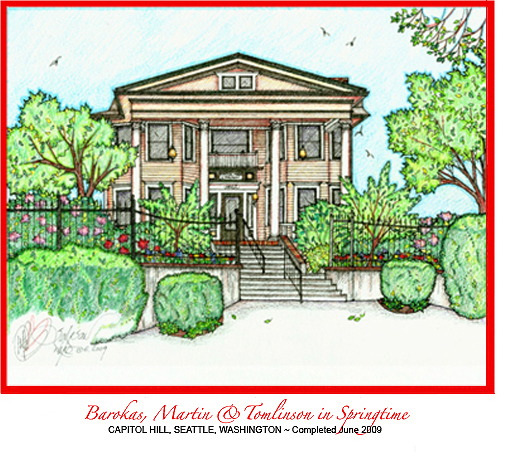 I have dozens of samples of home portraits in every architectural style imaginable. Problem solving can be challenging, but ALWAYS rewarding. Nearly every commissioned piece presents one difficulty or another, so I've shared a few challenges with their solutions here. Each example has a photo of the artwork setting coupled with it. CHALLENGE: EXPEDITING THE PROJECT ~ This pretty blond brick bungalow with green and cream trim overlooks Cannon Hill Pond in Spokane's South Hill neighborhood. It served as the Shelledy family home for several decades and this family absolutely LOVED the home. When I began this piece, Janie Shelledy had already passed away and her husband Pat was in declining health ~ spending his last days in the hospital. His adult children Dave and Patty were there with Pat much of the time sharing stories and memories with their dad ~ family reunions, Christmas holidays, misadventures of the kids and more. These conversations spawned Dave's request for this portrait of their family home. 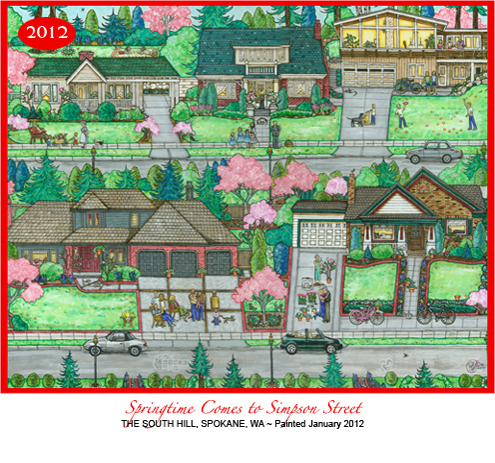 The obvious challenge was to finish the artwork as quickly as possible so it could be hung in Pat's room where he could see and enjoy it every remaining day. SOLUTION: PREPARATION, PLANNING & RESEARCH ~ With some direction from me, Dave and Patty went to work digging through old albums and boxes of photos. Blessedly, the two not only found some great snapshots, they put their heads together and collaborated on an overview of the history of three generations of their family. Pat's children gave me everything I needed, so the "guess work" was taken out of the equation. At times, the artwork felt like it painted itself. As you can see by the image here, I was able to include all three generations of Shelledys ~ the grandparents on the steps, parents in the driveway and kids playing in a huge pile of leaves on the driveway. Pat was moved to tears at this "story of his life" on canvas. 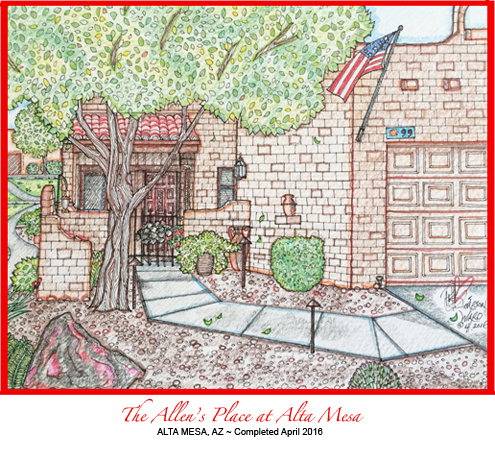 In 2013, the original artwork went to Dave Shelledy on his milestone 60th birthday ~ the most perfect gift as this home had so many cherished memories for him. 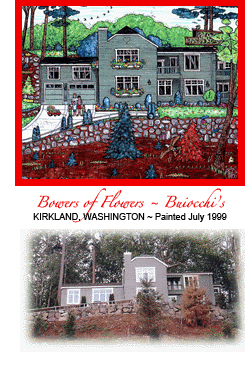 "BOWERS OF FLOWERS AT THE BUIOCCHI'S"
Other than hiring a helicopter pilot to fly me over the property so I could shoot the photographs necessary for this project (these days, perhaps drone operator? ), I was in a complete quandary as to how to finish the painting while maintaining its architectural integrity. And, not only was the home nearly impossible to photograph, the heavy shadows created by the tall trees in full leaf made the color of the residence's siding change substantially at different during of the day. There were several different shades of green ~ which one to choose? SOLUTION: PHOTOSHOP & SEVERAL ON-SITE CONFERENCES ~ Adobe's PhotoShop allows designers to do practically anything! I've used this software for decades and it's one of my favorites because of its flexibility and myriad of options. I shot lots of digitals of the residence, created a contact sheet and then pieced together enough of a reasonable composite image that allowed me to see the "bones" of this home. This rough composite collage gave me the diving board that allowed me to begin. I nearly always work from photographs as each piece takes many, many hours to complete ~ but getting the color just right on this home was a very elusive challenge. After several false starts, the owners and I sat on their stone wall and mixed paint colors on my palette until we were able to agree upon a shade that we both thought did justice to the house. Thus the final home portrait that you see here. 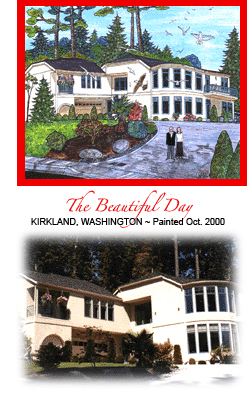 CHALLENGE: PAINTING A HANDSOME (RATHER THAN "CUTE") PORTRAIT OF A CONTEMPORARY HOME ~ This beautiful, contemporary stucco residence was wrapped around a Kirkland hillside overlooking Lake Washington. The owners appreciated my style, but were worried the finished product might look too "cute" for their home's contemporary, sleek interior. They wanted the artwork to be appropriate to the their setting. 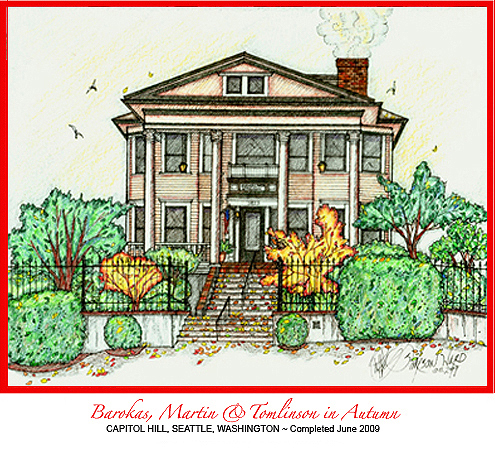 SOLUTION: MORE PERSPECTIVE & A CHANGE IN FOCUS ~ I actually did two things that helped me create a successful portrait of this attractive contemporary residence. FIRST ~ introduced more perspective into the piece than I was using in most of my paintings at the time, using several photographs of the property. Although I focused on the important architectural details, I did my best to make this piece have a more realistic, authentic feel. Plus, I kept my rendition more simple than many previous works. SECOND ~ The wooded forest and thick foliage around the house was varied and lush, so I spent a lot of time and care recreating the natural surrounding. The greenbelt was teeming with all kinds wildlife and birds ~ families of eagles, hawks and seagulls, so some of those winged creatures made their way into this painting. When I delivered this pieceto the owners, they were so delighted with the final results that they requested a wedding-theme alteration of a print to create invitations for their New Year's Eve home wedding. Click on my Bridal to see this artwork. 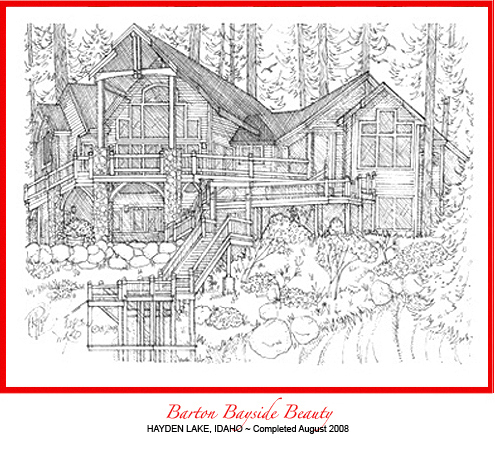 For many years, I've built a reputation with my renditions of remarkable homes, landmarks, parks and other architectural settings and subjects. In 2009, I began painting portraits as well. The three paintings below portray our granddaughter Addison, grandson Austin and my dear friend Jennifer Petras' little ball-of-fire son Jared. I completed these works as special gifts in honor of the kids' birthdays. Our daughter Leah and son Kevin gave us three more darling grandkids, so portraits of them are on my list to complete soon. IT'S ALL IN THE DETAILS ~ Who was it that said that? Brilliant Martha Stewart? She's right. It IS all in the details. To create a truly compelling portrait, I've learned that the secret is more than painting a pretty picture. The key lies in learning about each subject and discovering whatever it is that holds their interest and makes their personality shine through. During this stage before I put my paintbrush to canvas, I look at dozens of photographs and spend a little time with the subject, if possible. I interview family members (or owners if its a pet) and this helps me plan the portrait. I take lots of notes, listing of all the things about my subject(s) that make them unique. This includes favorite colors, things they love, what they like to wear, favorite treats, music ~ and most importantly, what their smiles and eyes say about them. The "getting-to-know-you" stage is crucial ~ almost more important than actually painting the portrait. The more I know about the subject(s), the more the finished work l captures their essence. This step is invaluable in helping me create the results their parents are hoping for. "AUSTIN AT PLAY" ~ As they say, "The apple doesn't fall far from the tree." Like his daddy Kevin, our grandson Austin Lee loves absolutely anything and everything electronic. He's not at all like "G-Dub" as our grandchildren call my husband. Doug looks at computers as a necessary, but aggrivating means to an end. If he never had to turn another device on other than his iPad and iPhone, he would be the happiest guy on this planet. The portrait above captured Austin's complete fascination with his birthday cell phone. It was pretend, of course, but equipped with lots of realistic "bells & whistles" that kept him coming back to it time and time again during his birthday party. Austin received a huge pile of gifts that day. Who knew this one would be his favorite? Of all the photos I took of Austin, the one that I used to create this portrait showed how much this little guy intensely focused when playing with his toys. He's not smiling, but content nonetheless ~ only looking up for a couple seconds before going back to the phone that held his interest that day. 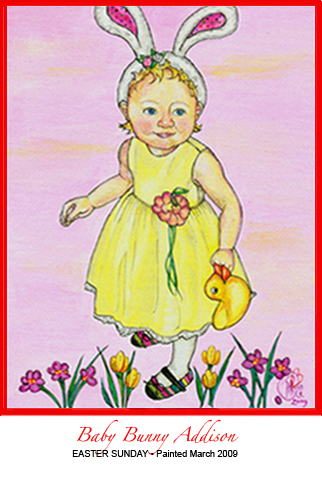 "BABY BUNNY ADDISON" ~ Our eldest granddaughter has always been an extremely feminine young lady. This aspect of her personality has persisted and developed ~ even though she's much older now (almost a teenager) than when I painted this piece. She's on a soccer team, but also takes dance lessons from her Auntie Leah. With the lovely, frilly costumes she gets to wear at competitions, my guess is that she loves dancing more. When I painted this piece, Addison had just turned two. That Easter Sunday, she was happily wearing this sweet yellow frock, a gift from one of her other doting grandmothers. The outfit was topped off with white furry pink and white bunny ears and rainbow-striped embroidered "Mary Jane" slippers. That holiday, we gave her a basket filled with chocolate bunnies, Beatrix Potter storybooks and a family of rubber duckies. One of these bright yellow ducks really caught her attention and she carried it around in her fist for the rest of her visit that day. She even had it on her lap at dinner ~ not usual protocol, but it was a holiday! These simple details plus a few spring blossoms provided inspiration for not only this artwork of her, but of the special family Easter holiday. "PRECOCIOUS JARED PETRAS" ~ My friend Jennifer and I have been close friends since we worked together for over a decade in the 1990s. In 2015, I gave her the original of this piece to celebrate her 50th birthday. Jenn was an invaluable help on Doug and my wedding day, managing lots of little details that came up. When Jeff married her sweetheart John, I helped Jenn with her bridal invitations. A few years later during her pregnancy, I promised her that when her little guy showed signs of a real personality, I'd paint his portrait. Being around Jared, I soon found that in addition to being a blur of activity, he was a most curious little boy. He loved our back yard in Sammamish ~ especially the fruit trees. He was still a little wobbly on his feet, but I could tell that it would be just a matter of time before he'd be off the ground, climbing anything that presented the opportunity. I did my best to capture his wide-eyed wonder in the portrait above. His mom, dad and grandparents loved the results. My husband Dougie and I are "cat" people. The brother and sister Siamese-Burmese kitties pictured left in front of the Campbell House were Doug and my constant companions for much of our early marriage life. We lost Andy in 2011 at Christmastime and Sophie in Autumn, 2014. They still find their way into many of my paintings and anchor the bottom of each page of this web site. We still miss our "Kittiewinks" terribly. 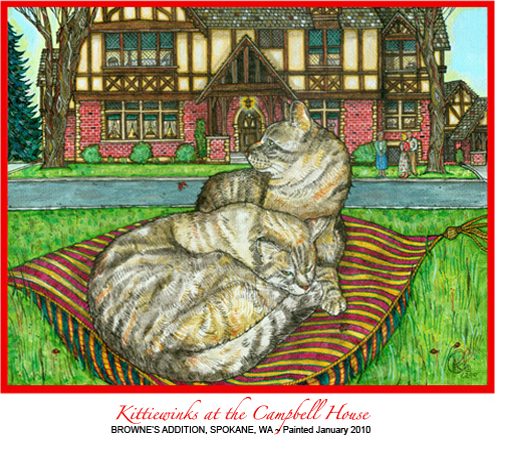 Highlight ~This painting below left is the cover art for a book I am creating, "Andy & Sophie Visit the Campbell House," about the historic Amasa Campbell Mansion. In 2017, I completed the other three pet portraits featured below. The kitties pictured to the right were my sister Marilee's pride and joy. Sadly, thewhite kitty Cookie passed away April, 2017 and the tabby Lady in December, 2018). 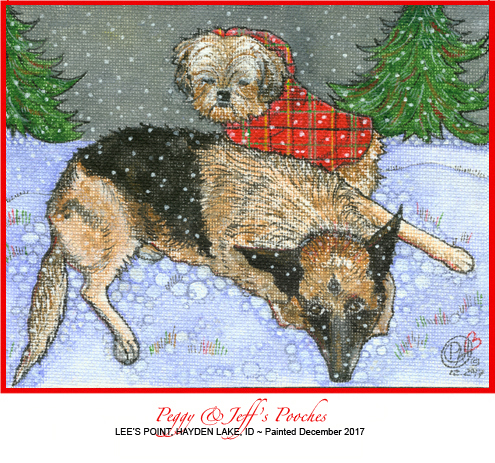 I finished the two dog scenes for both Marilee and Peggy for Christmas. I am also working on one for my brother Bob's family of the two "Boogs" (as the family calls their dogs). Look for that artwork here soon!